Yep, so many music festivals, so many venues. 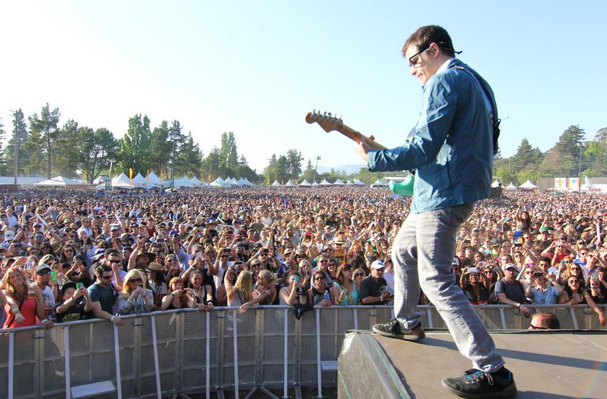 But can any match the splendor and resources of Napa’s BottleRock (May 29-31). If you think about the requirements for a festival like this, one of the first is a relatively cheap large land mass available for staging. This is why festivals end up in the desert or swampy areas where the charm factor is decidedly lower — not unlike amusement parks, which also appear in areas with plentiful real estate at a bargain. BottleRock, however, differs. It’s like the Cedar Point of music festivals. Cedar Point is the midwest gem set on the white sandy beaches of Lake Erie with spectacular 360° views of coastal splendor. Oh, and also the fastest highest bestest roller coasters in the world. With BottleRock you add in not only the landscape of Napa — but follow it up with arguably one of the world’s top ten destinations for vino and culinary culture. High-end concessions in a lush setting and artists to match. Sip some Clos dul Val and watch Snoop Mutha Fukking Doggy Dog? Yes, pretty please with whip cream and a artisanally sourced cherry on top. They’ve added a culinary demonstration stage with Ken Frank of Le Toque, Michael Mina, and Snoop Cheffy Chef sneaking over from his music stage. Prices are reasonable too — $120 a day vs. almost $400 for a weekend at Coachella. My personal favs in 2015’s lineup include Portugual the Man, No Doubt (would that they play some Steffani solo stuff), The Avett Brothers, The Mowgli’s, Robert Plant (I pray for him on those high notes), Grizfolk, Public Enemy, AWOLNATION, Echosmith and Los Lobos. I wonder if Scott Weiland’s band will do some of his Mister Mister stylings he used to effect before STP?